Defining an object we think we know intimately. What exactly is a book? In The Book, I have tried to define it with respect to its status as object, content, idea, and interface. By nature slippery, the book has taken numerous forms over time and been the subject of extensive experimentation by artists, filmmakers, tinkerers, and bookbinders. 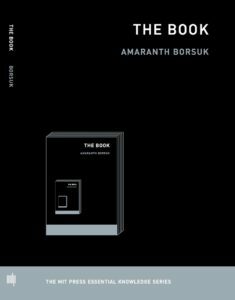 In April, 2018, I began contacting writers, artists, and scholars I admired to ask them What is the/a book? You'll find their answers here in an attempt to draw attention to the many other formulations of what the book is and can be. A book is where the far away meets the near at hand—the tea cooling on the table—the hard seat of the chair—the horn sounding outside the window…..
Ann Hamilton is a visual artist internationally recognized for the sensory surrounds of her large-scale multi-media installations. Using time as process and material, her methods of making serve as an invocation of place, of collective voice, of communities past and of labor present. Noted for a dense accumulation of materials, her ephemeral environments create immersive experiences that poetically respond to the architectural presence and social history of their sites. Whether inhabiting a building four stories high or confined to the surface of a thimble, the genesis of Hamilton’s art extends outwards from the primary projections of the hand and mouth. Her attention to the uttering of a sound or the shaping of a word with the hand places language and text at the tactile and metaphoric center of her installations. To enter their liminality is to be drawn equally into the sensory and linguistic capacities of comprehension that construct our faculties of memory, reason and imagination.